All of us at Lady Cactus were so happy to sit down with one of our favorite up-and-coming Colorado bands, Slow Caves. We got to chat with the group about their upcoming LP ‘Falling’ due out on March 22nd with Old Flame Records, the growth throughout this recording process, and what frequent touring has been like for them. Check out their latest single ‘Girlfriend’ along with our conversation below! Q: What is the songwriting process like with this group? A: This band is about 5 years old, we started it at the end of high school. Over the years, we have all progressed as musicians and songwriters, and the process has changed because of that. About 25% of the songs were written throughout the year while we were touring, and that was a more collaborative process. Oliver and Jakob are the primary songwriters, and would bring various ideas to the band so we could finish it together. There were a couple of songs where we only had rough demos, and we actually finished them in studio during the pre-production phase. Falling through Clouds is a good example - the first time we played that song together as a band was in the studio. The rhythm part was done live in one take, which we can only blame on the lucky magic of the studio. We write collaboratively, individually, and spontaneously in a process that was always very therapeutic. Q: Was there a concept behind this album? A: There wasn’t a concept going intro the process, but a lot of the songs deal with different aspects of responsibility, guilt, and resentment. Falling is a word that kept coming up over and over, both unintentionally and intentionally. The first single talks about falling apart and struggling with mental health, both abstractly and realistically. It’s about dealing with true emotion and working through things. Q: The album was recorded in Austin, Texas. Was is a new experience to record in a different state than Colorado? A: Yes, it was our first time recording something out of state. It was very inspiring to be in a new environment, especially because we had never been to Austin outside of SXSW. The city has so much history, and so many amazing bands from 90s + 2000s that were very inspiring during the process. Going to an unfamiliar place is great for pushing yourself creatively. Q: How do you view this album next to previous work in terms of processes and otherwise? A: We have all matured as musicians and songwriters, and I think that shows in the album. We definitely used it as a tool for coping with depression and anxiety, which I know is very common in art, but it felt like something new for us. The songs feel much more honest. We went in with clear goals and sculpting ideas, and as a result, I think the songs are more expressive than things we have done in the past. We also took a much heavier and more atmospheric approach than we have before. It was great to write rock songs with chords we’ve never used, with melodies and lyrics that pushed us a little more. Q: What bands or artists were you most inspired by during this process? A: There are so many! There’s this great band from Canada called Dead Soft who really inspired us. And there were lots of bands from the 90s, both from America and England, like Oasis, Nirvana, My Bloody Valentine, and Guided by Voices. Q: You’ve spent the last few years touring all over. What’s your favorite part about touring? A: David Dugan [bassist] has a huge family, and we get to meet a new Dugan in almost every single state we play. They’re all equally as friendly as the next; they always let us crash with them and make us meals. So my favorite part of tour is meeting the Dugan family. Q: Do you write while you’re on the road? A: It’s much harder to write while we’re on the road. It’s easy to get tied down to a specific writing process that is centered around having an audio interface, and not having that on the road makes it a much different process. I appreciated being pushed to not rely on having those resources, and overall, it’s a great thing. You meet interesting people, learn about places, and get a lot of inspiration. But it’s still hard. Q: What is your least favorite part about touring? A: It’s very isolating being in a van all day, especially on the western side of the states. You’re surrounded by your best friends, but miss things like feeding your dog, hanging out with your friends, or just being alone in your bedroom. But it makes your life more dynamic, so there’s good in it. Q: Can you talk a little bit about your film diary? A: Jakob bought a film camera at a thrift store this summer, and became obsessed with carrying it around to take pictures of everything and everyone. Photography is an incredible creative outlet while traveling. You see these amazing people and places, and you get to document it. View the Film Diary here. Q: You’re releasing your new album (Falling) on March 23rd at Globe Hall. Can you talk about your release show and the bands sharing the night with you? A: Yes! We are so excited to celebrate the release our first LP with Old Flame Records on March 23rd at Globe Hall. It’s becoming the coolest venue in Denver of that size. We are so excited to have One Flew West and Gestalt joining us to celebrate. We have known known One Flew West forever, and played a lot of shows with them. It feels like we have kind of grown up together as bands in the scene. Gestalt is young and energetic and amazing, which is exactly who we want to be playing with. People who are exciting and having a good time. Find information + tickets for the album release here. 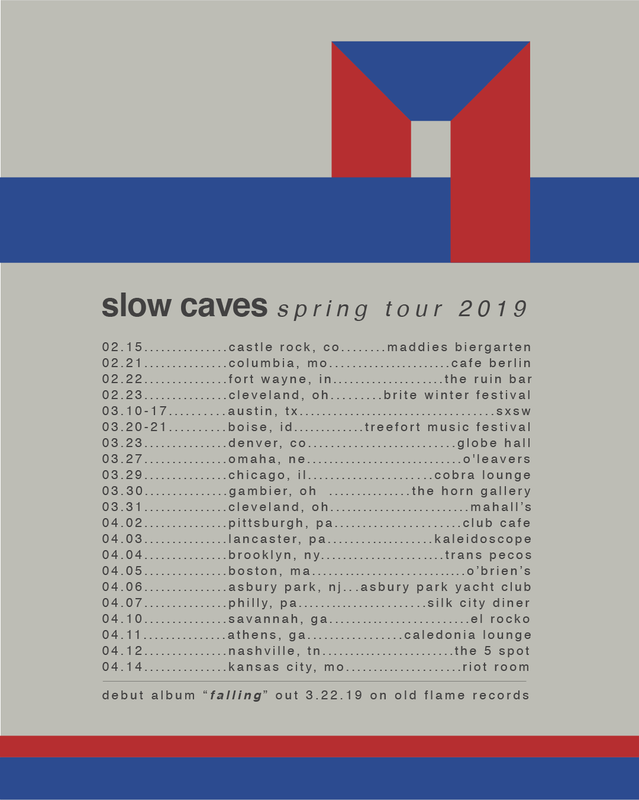 Thanks again to Slow Caves for chatting with us, and congratulations on your upcoming album release! You can find them on social media here, here, and here. Listen to ‘Falling’ (Old Flame Records) everywhere on March 22nd, and check out the release show on March 23rd at Globe Hall in Denver. You can also catch them on their spring tour - dates below!